One of the coolest things about the rise of mobile games is watching the platform evolve in fast-forward. Every day we see new ideas forming out of old ones, business models adopted, abandoned and rebuilt, and the capabilities of iOS reaching brand new heights. Case in point: Ragdoll Blaster [$0.99]. In 2009, this was a doodle-style physics puzzler with a barebones interface. It was massively popular, but the App Store was young. In 2011, Ragdoll Blaster 3 [$0.99 / HD] is an explosion of color and whimsy, with few sacrifices made to what makes the series great: damn fine physics puzzles. I love how these games make you think a bit about applied physics. It’s not just knocking over this tower, stacking that block without letting the whole works fall, it’s levers and pulleys and magnets on top of all that. So it’s great to see the puzzles wrapped in a much more appealing package. That’s the best sort of makeover, wouldn’t you say—one that makes the outside as fine as the inside? The new look has something for everyone, except perhaps lovers of doodles or dark, moody steampunk. If you’re into cute things, you’re set. The art is colorful and bubbly, the ragdolls have reached their ultimate Sackboy evolution and the whole interface looks like it’s been sewn and glued and stuck together out of cardboard and plush. If you’re more into high-score hunting and precision, Ragdoll Blaster 3 has you covered too. The interface now has space to drill down to more detailed ratings: the number of dolls blasted, time taken, and buttons collected contribute to your total score and star rating. If you’re new to the series, here are the basics. Each level has at least one cannon and one target. You need to shoot a ragdoll from one to the other by touching the screen, with a visible firing guide helping you on your way. You control each shot’s power, arc and aim with a single touch of a finger, with distant shots firing with more force than close ones. The ragdoll launches on the arc you set, interacting with everything in the level and hopefully reaching the goal, or at least the next cannon, at the end of it all. The ragdolls come in five flavors, all of which are stupidly cute. You’ve got your standard ragdoll, who does nothing more than flop on command. You’ve got an Ice doll that slides like mad on frozen surfaces. Pudge dolls are heavy and look it, and the rather unhinged Fire dolls burn any wood they touch. Then there’s the robot, who’s as attracted to magnets as his metal body implies. Ragdoll Blaster 3 doesn’t give you free reign with the dolls (though wouldn’t it be cool if it would?). Instead your options are limited by the cannons present in any given level. Each cannon is set to a single type, and you can activate new ones by firing dolls into them. This lets Backflip Studios create adorable things like a cupcake cannon that launches Pudge dolls, and it lets them keep control of the ways you can complete each level. On the flip side, though, it keeps your solutions from ever feeling particularly inventive. If there’s a second cannon, you’ll need to reach it. If it’s a fire cannon, be on the lookout for wood. It’s a little too cut and dry, especially since the more creative levels are wildly entertaining. That’s not to say there aren’t many creative levels, but in a list of 100 physics puzzles there’s certain to be a few duds. I’d happily pass on pixel-hunting levels, and there are a few of them. Whether by design or by accident, certain levels don’t seem to work quite how they need to work, and getting through them requires either great luck or a growing pile of carefully flung dolls. This is where a level skip would come in handy, and while Ragdoll Blaster 3 has one, it’s not the best kind. 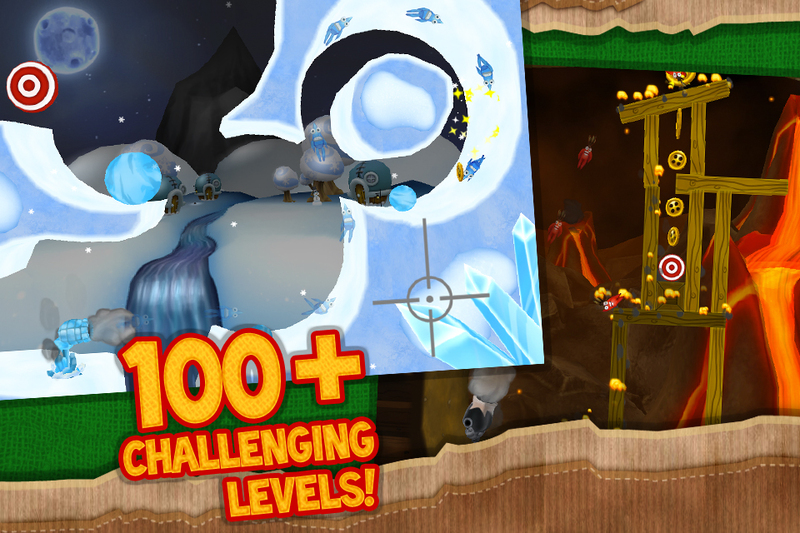 As in Angry Birds, you can pay to unlock a Mighty Eagle-style Rocket Ragdoll. It’s on an hour cooldown, and you can pull out in-game currency to speed that up. There are also solution hints (read: “spoilers") for every level, if the problem you’ve run into is more where to fire your shot and less “why won’t this bloody doll hit the block so it moves the other block like it needs to?". Did your ears perk up at the mention of in-game currency? Don’t fret, it’s not a big thing. Every level has buttons you can collect, and they contribute to your level score and ranking. You can then use them to unlock adorable costumes for your dolls—I was tempted to grind for the Robot Knight. If you’re short on buttons and you don’t want to grind, you can pay for them. While grinding gives you a way to pass the time once you’ve burned through all 100 levels, and you can always hunt achievements or work on your scores for the Game Center leaderboards and hidden stars, what I’d really like to see is an update with a few more levels. Ragdoll Blaster 2 was a bit tougher and more inventive on the whole, and I’d love to see Backflip take this game to that level. 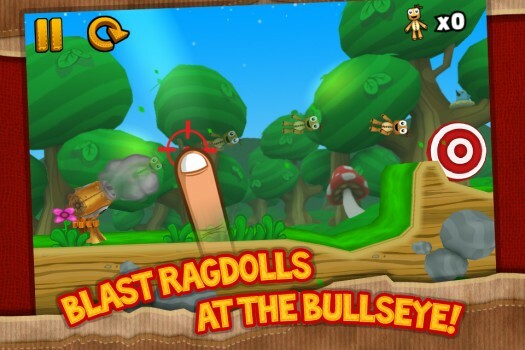 With its looks it could easily be an App Store darling, but right now Ragdoll Blaster 3 is a bit lacking in longevity. The game could hit a sweet spot for challenge with a few of the missing elements from 2, like portals, and a few more levels that combine all the different dolls. As it stands, the game is still easy to recommend. For long-standing fans, it might be a little too simple, but there’s a lot of promise and plenty of new content. For new players, it should be just right. Ragdoll Blaster 3 is more inviting than the series has ever been before, and it’s filled with fun physics challenges at the cost of relatively little frustration. If that’s not enough and you want a serious challenge, swing by our forums. There’s an ongoing competition for fewest shots, and I assure you it will leave your ragdoll blasting skills sorely tested. Recently selected as Apple's iPhone GAME OF THE WEEK!